Yes, I am writing about a cleaning product. Go figure. I have been cleaning bathrooms and kitchens my whole life. I have used popular cleaners, cheap cleaners, harsh cleaners, natural cleaners, and cleaners design to strip off whatever it touched. I have been in my current home about 6 years or so. It’s a great house – we absolutely love it, but it was built in the 1970’s and our second floor bathroom hasn’t been updated. How bad is it? Think 1970 avacado green appliances, only for a stall shower. Now you get the idea. This shower is so old that there is not really any shine on it…it’s finish is worn. So when it gets dirty from soap and shower products, it’s really hard to clean. I hate cleaning this thing…seriously. Which means that I do it, well, less frequently than necessary. For years I have been a big fan of Scrubbing Bubbles, but in this case, even that product falls short ’cause you still have to scrub it. I have used rags, sponges, scrub brushes, dish scrubbers, even loofas. it’s the scrubber itself that is the issue. You have to scrub this shower no matter what. 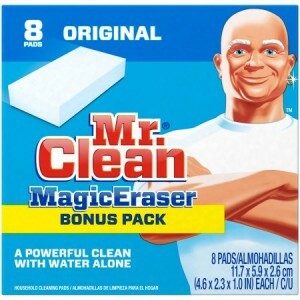 One day my daughter was raving about Mr. Clean Magic Eraser. It looked like a pretty lightweight product (literally) when I checked it out, but I’ve tried everything else on this shower, so why not. I was kind of annoyed when I opened it up – I thought I was missing something. This thing is just a soft little scrubber. Whaaat? Turns out it isn’t a cleaner that’s in it, but the actual scrubber itself. It’s feels like a cross between a sponge and a chunk of memory foam. Whatever it is, it works like a stinkin’ charm. I cannot believe what a great job this thing did in my shower. Can’t wait to try it everywhere else!